A group of activists wearing military uniforms and balaclavas has blocked the office of the TV channel ‘Inter’ in Kiev, Ukraine. Broadcasting has reportedly been interrupted. A group of men first insisted that representatives of the station talk to them. When their request was not fulfilled, they announced the blockade. 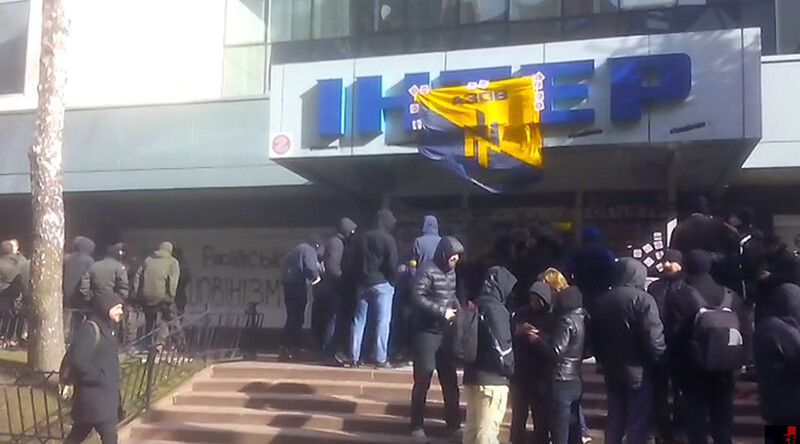 They have been reportedly chanting slogans "Ukraine above all" and "Glory to Ukraine." The men are demanding the channel backtrack on what they term ‘Kremlin censorship’ and ban screenings of all Russian films and TV series. According to the activists, "Inter employs many guys who are really good journalists, but all of them are under Kremlin censorship." — vgolosua (@vgolosua) 25 февраля 2016 г. Police officers are on stand-by, a correspondent from 112 Ukraine TV reported, adding that as things stand, the action is taking place without any incident. This is yet another development in the controversy over Inter journalist Maria Stolyarova, who was expelled from Ukraine and banned from entering the country for five years. Ukraine's security service says the journalist used rude language to refer to the slain Maidan activists. She is also being investigated in connection with her visits to the breakaway Donetsk and Lugansk Regions in 2014.